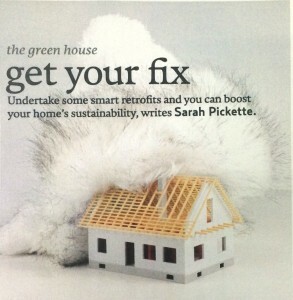 Undertake some smart retrofits and you can boost your home’s sustainability, writes Sarah Pickette. There is no one-size-fits-all answer to the question of what works best, says McKenzie, but he believes in improving every home’s passive solar design by exploiting it’s orientation and ensuring it’s eaves and exterior shading are up to the job, and facilitating good cross-ventilation. Air-leakage prevention is the number-one retrofit suggested to homeowners by Nick Mayo, sustainability adviser and owner of Canberra’s Sustainable House. “It is so important to draught-proof your home. Air gaps around doors, windows, vents and even power points are the cause of so much energy wastage.” He advises choosing quality seals for doors, which cost more but could last up to 30 years. Insulation is the next thing to check, says Mayo. “Get an infrared camera and take pictures of your home’s exterior. Using thermal images, you can determine the amount of heat loss from your walls and roof, and pinpoint exactly where the greatest losses are occurring.” If you identify major weak spots, blow-in insulation for your walls can be very effective, he adds, noting that rockwool is his preferred material. Both McKenzie and Mayo agree that putting in photo-voltaic panels or a solar hot-water system is a smart move because it pays for itself in a couple of years and minimises energy costs after that.